Kassidy Rosengren, a sophomore at Argyle High School (photo by Pam Arrington). Kassidy Rosengren, a sophomore at Argyle High School, is the first AHS student to make the Texas All-State Small School Mixed Choir. Kassidy will perform in concert in San Antonio for the annual Texas Music Educators Association Convention, according to Argyle ISD. 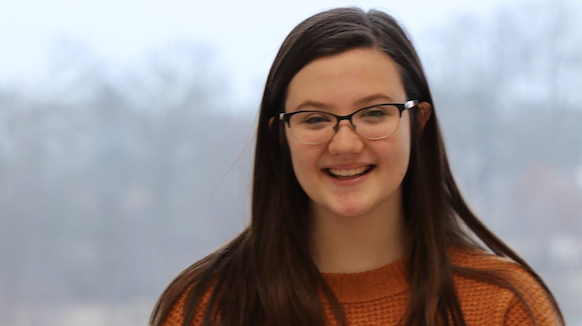 “I feel so lucky to be the first All State-er from Argyle since the AHS Choir was established and I couldn’t be happier with how all of my work paid off,” Kassidy said. Sophomore Jackson Barnes was selected as the 1st Alternate in the Bass section and Sophomore Austin Rusk was selected as the 2nd Alternate in the Tenor section for the North Area of the state. The All-State Choir preparation process begins in the summer and continues throughout the school year. Many students, including Kassidy, attended All-State Choir camps during July and August. Beginning each fall, almost 3,000 high school students across the state audition for the TMEA All-State Small School Mixed Choir.